The Deep Series by Deep Forest has been an exciting project to follow over the last few years. Here Eric Moquet has selected a country or continent and created an interpretation of its sound – or soul if you will. Last out is Deep Africa. Read on to see if it is a successful musical journey, or if the African forest turns out to be just too deep for this French expedition. First out in the series was the incredible Deep Brasil (2009), which is filled with unforgettable melodies and strong vocals. It is one of the best albums released in our genre for years. Then then we have Deep India (2012). Here Eric Mouquet worked with Santoor player Rahul Shama. It is a nice enough album, but really doesn’t add much new to the project. Then we have this year’s release. Deep China will be released at a later date. First I must admit that I have been a Deep Forest fan for almost 20 years. I absolutely love their 90s albums, including Made in Japan (1999) and Pacifique (2000). But as a New Age music radio host I know that I must be careful when programming Deep Forest. Sample heavy songs are rarely highly rated. 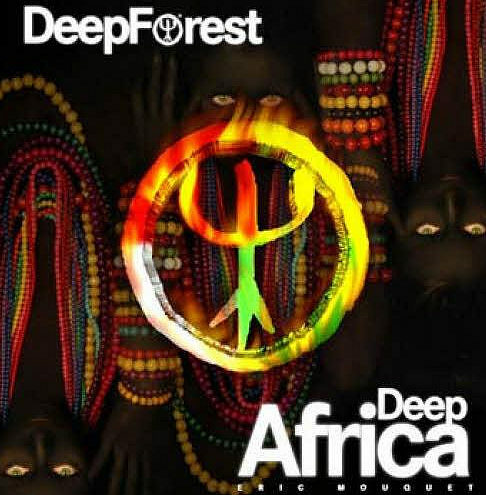 That said, Deep Forest has many songs where ethnic samples add great atmospheres – and the international hit Sweet Lullaby is the best example of this. Deep Africa will sadly not be a new hit, at least not for this reviewer. Here I think the samples are too loud, in too high numbers and many times just don’t fit together. Some samples are even modulated, like when you test a sample in a sequencer (first you play the sample as a C note and then a D note, and then in an E note).It sounds harsh listening to it the first time, and it doesn’t improve when you listen to it again and again (I have tried!). Perhaps the idea was to describe the deepest of Africa, with all its loud noises and heat. But the result is an album where voice samples are destroying what could be nice melodies. The best track on the album is Mosika, which reminds of the classic Madazulu. The track Bedi also has the drive we should expect from a major artist. The last minute of Ho Mambo is simply beautiful, and an indicator of what this album could have been if it hadn’t been ruined by surprisingly bad sample mixing. They are “just all over the place”. In order to set a correct score, I relistened to some old sample heavy Deep Forest songs, namely Madazulu and Deep Weather, to see if I was unfair to the new release. But no, these tracks still stand rocksteady. All I can say is that the album will be hard to sell in the New Age music segment of the market. There might be fans in the dub/90s Eurodance market that will find this sound more to their liking. We have already received a taste of what the next installment of this series, Deep China, will be. The single Won’t take long was released prior to both Deep India and Deep Africa. Here Eric Moquet has worked with Chinese singer Sa Dingding. It has a great melody and an excellent vocal. Hopefully this is the Deep Forest we will get to hear more from in the future. 68 / 100 – See how we rate albums here.